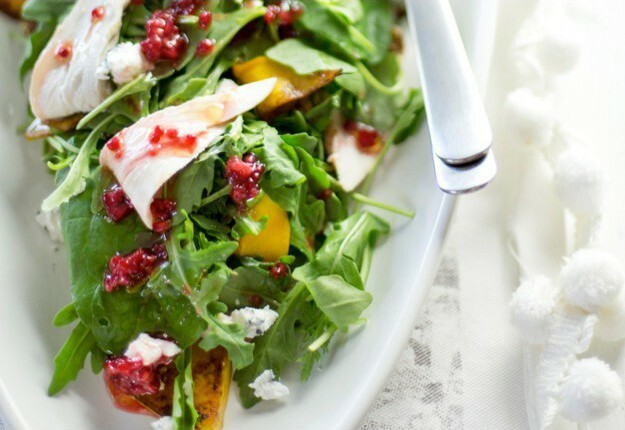 Left over roast chicken is ideal for this delicious, quick salad with slices of fried pumpkin and tangy raspberry dressing – the perfect addition to your summer table. Heat a frypan over moderate temperature and add in the oil. Fry the slices of pumpkin for 2-3 minutes on each side sprinkling them with a little cinnamon and cook until golden, set aside on the plate. Layer the cooked sliced pumpkin into a platter , top with the shredded cooked chicken, walnut pieces, the spinach and rocket and crumble in the goats cheese. For the vinaigrette, smash 50g of the raspberries into a bowl and add in the olive oil vinegar, vinegar and the maple syrup, season with salt and pepper and stir. Pour this over the salad garnishing the salad with the remainder of the raspberries. Notes... -Vinaigrette is basically a salad dressing usually with equal parts of oil and vinegar, although you can make many substitutions and flavours using herbs, mustards, different oils and vinegars. -A Vinaigrette is a great way of bringing spices, herbs and fruits into your salads, poured over steamed vegetables or used for marinating before barbequing. -When shredding your roast chicken, be sure to cover it well in the fridge and eat it within three days after purchase or alternately wrap it in plastic and freeze it making it a hand and quick healthy protein addition to soups, pasta and salads. -Boil up the roasted chicken frame with carrots, onions and celery and season it with pepper corns and parsley for a delicious stock. Goat’s cheese is the best! I love the idea of raspberry and got’s cheese together! I would never have thought about cinnamon on pumpkin. drool, drool. I LOVE the flavours in this delicious, simple and light dish. Great for Summer. Thank you for this, it sounds a great combination to eat. Thank you also for the hints too. The raspberry vinaigrette surely brings a special touch!! Wow, I love a new and different salad and this one sounds amazing. Uses a few ingredients I’d never consider in a salad, but I’m prepared to try. This salad looks so fresh and vibrant! Perfect for a day when it’s too hot to be eating hot food. one of the best sounding and looking salads I have seen in a while! Nice and healthy. Great recipe. Thanks. What a great way to use left over chicken. Thanks for the tip on freezing the chicken. What a great recipe. Thanks for sharing. This is a winning recipe,absolutely love it! this is a yummy recipe, and I am proud to support my local IGA!! !